Between Galway, Offaly and Tipp. There are no words in Irish for "it is mine". 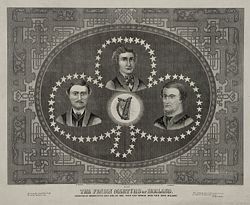 The Manchester Martyrs were Fenians, members of the Irish Republican Brotherhood executed for killing a policeman during a prison escape. William O'Mera Allen, Michael Larkin, and Michael O'Brien were hanged in Salford, England on 23 November 1867. These men were caught after having taken part in the attack on a police van carrying two leaders of the Brotherhood, Colonel Thomas J. Kelly and Captain Timothy Deasy. The incident took place on the borders of West Gorton and Ardwick, to the immediate southeast of Manchester city centre.